The MOTORWeb booking system opens your garage 24 - 7 - 365, meaning that your business never need miss another booking, new and existing customers can book the services that you offer online. All the bookings that are made are 'Live' bookings meaning that your customers has a confirmed booking - they are not 'submit' type bookings whereby the customer waits to hear back from you (You can of course still call your customer if needs be to reschedule). By offering customers the chance to book online means extra business. Your website is easy to use with little or no setting up. It contains all you will need to make your business succeed online. Option 1 provides a full great value website experience. Using one of our professional looking example websites. Your website can use a combination of your photos or you can use the photos and images used in the examples. All the text can be edited (or removed if not needed) with information you would like to use. This style of website can be expanded at any time in the future, adding addtional pages when you feel you need to. All the MOTORWeb booking features are incoroported into the website. If you would like just the website but not the MOTORWeb booking features then this is possible. Typically this option would be used when you have an existing website that you are happy with and you want to incorporate the MOTORWeb booking system into your existing website. This can be done very quickly, we will advise your own IT person who looks after your website on what is required. This option typically requires very little re working of your existing site. This option (our example 5) provides for a single website which incorporates all the benefits of the MOTORWeb booking system that you chosen. You can edit the content of the website and the website pages without the need to use any other software or an IT person . This provides an ideal solution for a lot of garages who want an easy to use system, who might from time to time changes things without needing assistance. 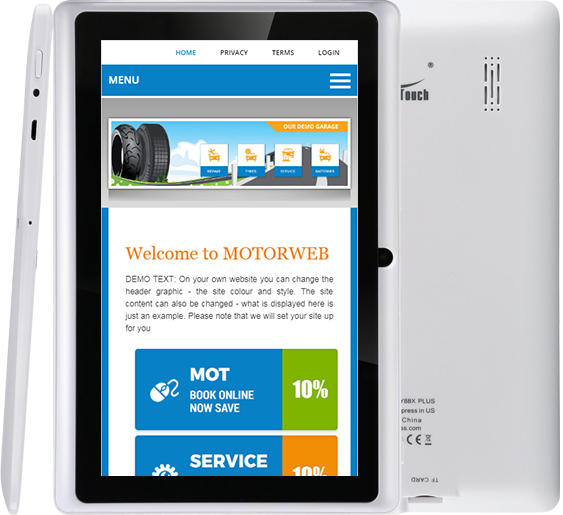 Using this feature allows both existing and new customers to book their next service or MOT test online via your website, you can choose to have either test or service booking features turned on or both. Not all your customers will want or be able to telephone during normal business hours - so offering them the opportunity to book Online means extra business for you. You can control how many bookings you take Online, so you are still in complete control of your appointments diary. With the added advantage of listing exactly what your service includes - you can be as brief as you need or as detailed as you wish. All the service items are created by you so they reflect exactly your business needs and requirements. PayPal option. If you have a Pay Pal account (if you don't have a Pay Pal account one can be set up very easily) you can use this account and turn the payments feature on within your website, with this turned on Pay Pal will process either your full Test fee or Service Fee or any process amount you have entered (this could be a smaller booking fee). Once Pay Pal have taken payment from the users card the booking is confirmed and your booking fee processed into your Pay Pal account. One of the big benefits of using this website style (Example 5) is that you control and edit the content of your website, without any prior knowledge of the internet, editing, uploading, webpages or websites. There is no software to install and you can connect to your website from any PC in the world. Updating the main screens is very easy (yes we promise it really is) and you will be able to make changes, edits etc. We can help if you need it. You can rename your web pages and the navigation buttons that access these pages - making your website very customisable, so if you carry out specialist work such as Air Conditioning you can rename a page A/C or Air Con. Alternatively you can change these buttons to open other webpages on other sites you might have, this is particularly useful if you already have a website and want to use this new website just to take your online bookings and still continue to use your current site. The main header graphics (up to 4) can also be changed and uploaded to your site if you want to change that in the future. Your website will be responsive - what that means is that your end user (your customer) can view the website on any device and the pages 're adjust' to suit the device. So, if your customer is using an iPhone, tablet, or PC all the pages look correct no matter what they use to view the website. MOTOR WEB © All Rights Reserved.